When our school was founded in 1861, the Marist Fathers brought their charitable ethos with them. In our own little way, the Missions group is continuing this tradition of charity the fathers began. Initially set up in 2005, the Marist Missions Committee has gone from strength to strength in raising funds for our international Marist family: bag packs, flag days, celebrations, guest speakers, trips – no avenue is unexplored and as such our tea making skills are now legend! But perhaps one of the most special aspects to the committee has been the creation of The ‘Ranong Missions Group’. Since 2007, a group of senior students of St. Mary’s College have undertaken to visit the region of Ranong in Thailand. The group who travel give their time and effort and have a most memorable life- changing experience working with the Marist Missions there. 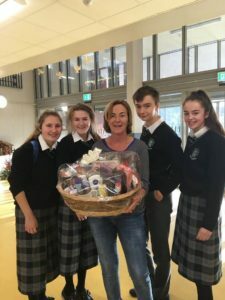 Prior to their departure, the students raise funds for those less fortunate in this region and then spend around three weeks teaching and helping on the Thai-Burma border. Those students returning have universally proclaimed it to be a most satisfying and enriching experience. And even as we speak, our current sixth years who plan to go ‘on the missions’ are working on bake sales and creating posters campaigns for this year’s trip. We wish them all the luck in the world! The Marist Missions Committee is an special group. Places are coveted, but only a select few are chosen!